To me, back extensions are one of the best core exercises. Get on the back extension device at your local gym. I think this may also sometimes be called a "Roman Chair." You can also simulate this by lying over an exercise ball with your legs straight and feet up against the base of a wall if you don't have access to a gym. You will be extended face down over the apparatus, with hips just past the shelf area and feet under the foot holders at the back of the device. Ask your trainer for advice on proper placement and safety if you have not used one of these before. You can put your arms behind your head and raise and lower your upper body from the hips to work both abs and back. Do not arch. Just bend down and raise up to a flat plane. You can also do the exercise with arms out in front of you, crossed at the wrists and joined at the hands, for extra resistance. You may wish to periodically hold the flat back position for a few seconds. Always use correct form. Back extensions are a controversial exercise. It places a tremendous amount of compression on your spine. If you have back issues, you should not be doing this exercise. Actually, I don't recommend it for anyone. 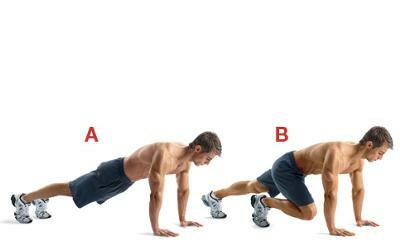 There are other alternative exercises that can work the back muscles safely, such as the plank, the bird dog exercise, and the farmer's walk. I have found this technique to be an interesting way to perform a great core exercise. Taking a piece of brightly colored paper, fold it in half so that it will stand up when turned over. Write your goal on one side of the paper, whether this goal is a weight you want to reach, or a size you are trying to get to. Place this "goal" on the couch cushion, right on the edge of the couch. Lie on your back with your feet at the base of couch, knees bent. Place your hands across you chest (for beginners) or place your fingers lightly behind your head (for advanced). Do 10 to 15 crunches (or as many as you can), resting after each set for about one minute. Each time you come up you will see your goal, and the reason for your hard work each day. The exercise will work your abs and the goals will exercise your determination! I have had success with the exercise ball as well, not only doing crunches from laying on your back, but also on your stomach, bending backwards as though reaching for your goals that would be secured on the ceiling. One more core exercise I find rewarding, is simple pushups with your goals written on a piece of paper and placed directly under you. The goal here is to not let your nose touch the goals! WHAT TO DO: Place your forearms flat on the ground. Then push up so that you are supported on your toes and forearms with your back straight. Keep your stomach lifted while rotating your hips to the right. (Your forearms and toes should remain where they were in the plank position, you should only be moving your hips.) Rotate back to plank position and the do the same thing only to the left. Repeat to the right, middle, left, and then middle again for number of reps chosen. Remember to keep your stomach lifted, it will help you get the most out of this exercise. Be sure to keep breathing, it lets your muscles get more oxygen so you will be able to stretch easier. Another variation of this is a full rotating plank. You start in the front plank position, but your arms are directly underneath you, parallel to each other, but pointing out sideways (rather than pointing forward). After 5 seconds, you rotate up into a side plank (on your right forearm, body facing left), with your feet shifting on to their sides (heel to toe). Hold that for 5 seconds before rotating back to the front plank position. After 5 seconds rotate into a side plank on the other side (on your left forearm, body facing right). Return to the front plank position after 5 seconds. Continue rotating from the front plank to the side plank (alternating each side) holding each position for 5 seconds. Do it for a total of 30-90 seconds, depending on your fitness level. This is a great exercise because it combines two core exercises everyone should be doing: Front and Side Planks. To help reduce strain on my neck, I find the vertical leg crunches (VLC) and bicycles are the best core exercises for me. I do the VLC without lifting my neck, since I have had problems with my neck most of my life. I still get a good ab workout. Bicycles not only work my abs, but my glutes too. I have recently started working with an exercise ball, but haven't mastered it yet. I am using this to help my balance as well as my back muscles. I lay over the ball and lift my torso up to strengthen the back. Great, great exercise. It works almost every muscle group, and does cardio at the same time! I've been doing 30 second, 15 second rest intervals doing this exercise. I was a lazy beginner, and this is all I did every day. Now, I can see my hip bones, and have a crease down the middle of my belly! Here's how to do it: : Begin in a pushup position. Draw your right knee in towards your chest, resting the foot on the floor. Jump up and switch feet in the air, bringing the left foot up and the right foot back. Continue alternating the feet rapidly. My standard ab workout relies on doing extended planks (90-120 seconds) as well as long runs of bicycle crunches (up to 5 or six sets of 50). Planks and bicycles are two of the best core exercises, IMO. I usually run them in alternate sets -- starting with bicycle crunches, than a "break" doing the plank (which is hardly a break at all, of course, but it is a bit of a cardio resting period). Then repeat three or four times. I've found that really pushing myself to the max at these kinds of activities really increases my enjoyment of them, as well as the results I see. The longer and harder I push on them, the more I feel endorphins kick in as well.